UPDATE: check out this great ScamWarners site. This post in particular exposes many of the common scams. I was in Round Rock, Texas last weekend and while there I used my MacBook to bring up the Los Angeles Times website. 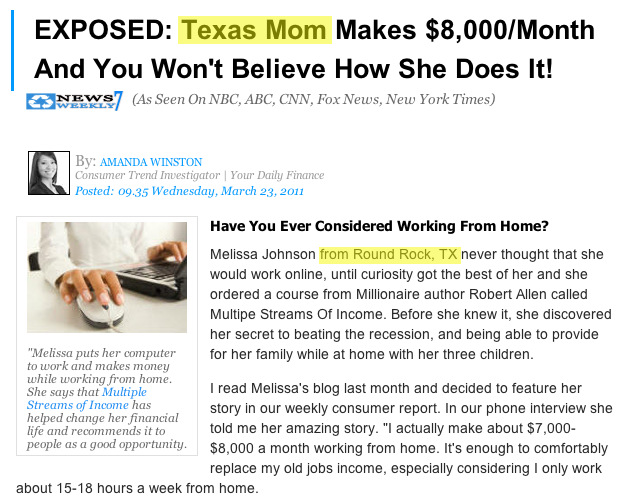 I noticed a couple of ads that mentioned a “Round Rock Mom” and wouldn’t have thought much of it except that the “Round Rock Mom” looked familiar. 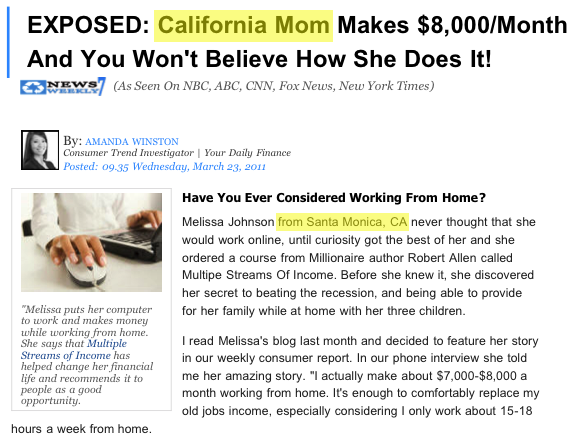 The reason she looked familiar is that I’d seen her picture many times before while reading the Times from home in Santa Monica– but, in those cases, she was cast as “Santa Monica Mom.” Hmm. And here’s how it looked when viewed in Santa Monica. I suppose they could be twins. But probably not. I did appreciate that they personalized things to my location either way. “EXPOSED” indeed. Scam-o-matic. But wait, there’s more! While in Texas, I accidentally clicked an ad and found myself looking at a web page telling me that I (me!) 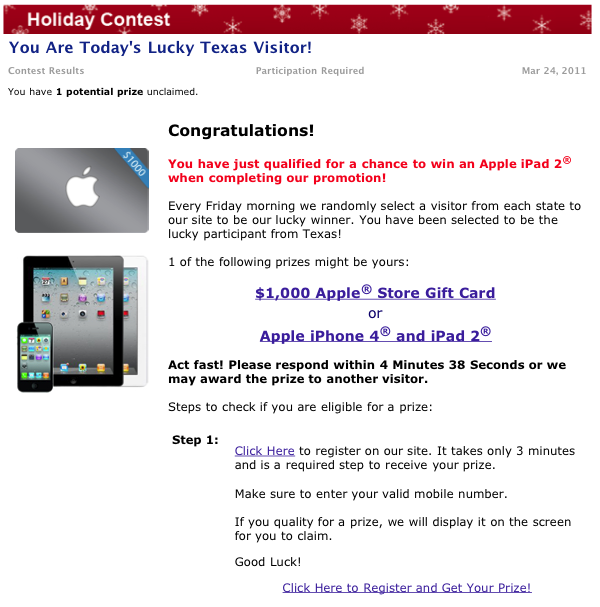 was “Today’s Lucky Texas Visitor!” See, it says so right on the web page. 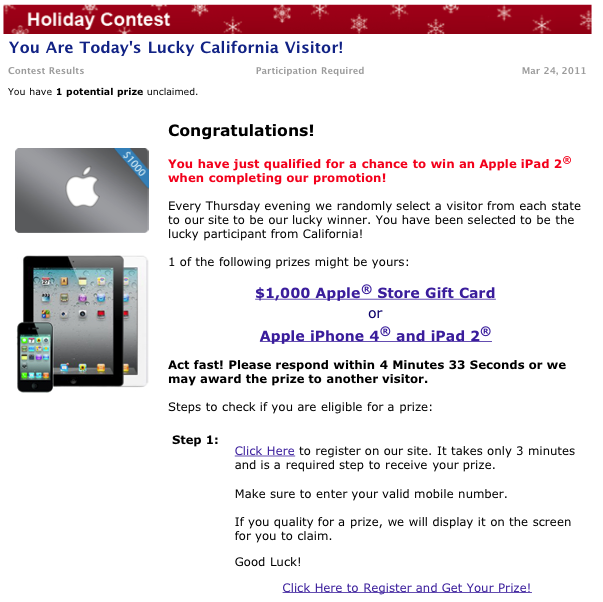 I wondered a little bit about the snowflakes and the “Holiday” reference at the top, but for a free Apple iPad 2 who’s complaining? I scrolled down a bit and saw a list of previous winners, and what do you know, someone in my own neighborhood was on the list. I didn’t know who she was but it had her name and picture and it said “Round Rock, TX” and that “proved” it. 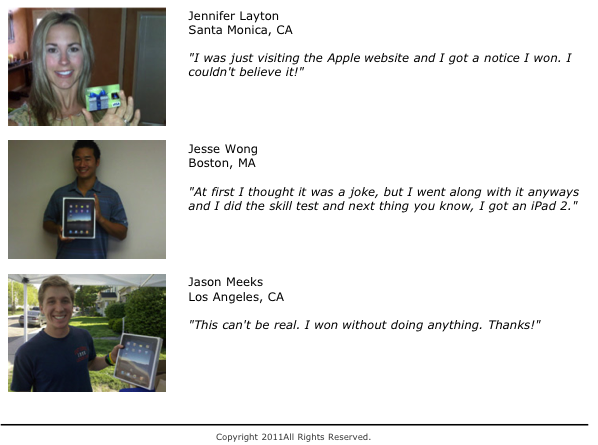 I scrolled down a bit to see the people who’d won before, and what a surprise to see our new friend Jennifer Layton– except this time she lived in Santa Monica. After seeing Jennifer in two places, I couldn’t believe it either. Turns out it is not very hard for a website programmer to determine the general location of your computer, based on your IP address. Try this link and see if it “knows” where you are. I’ll bet it’s pretty close. Eye-opening. The point is, don’t fall for the old “Gee, there’s a picture of someone from my neighborhood, that makes this offer so much more believable” trick. It’s probably faked. 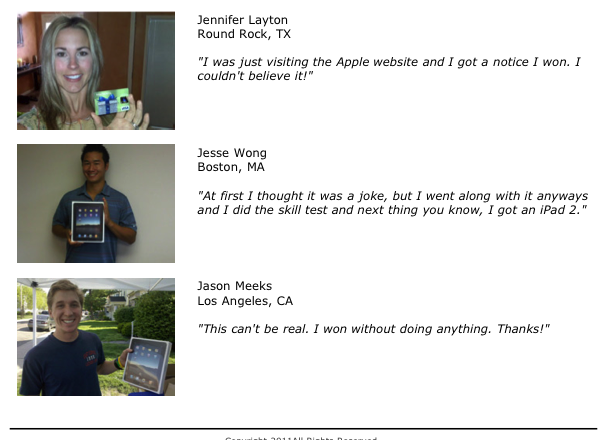 If you want $84 per hour, or an iPad 2, you’re going to have to earn it. Sorry to be the one to tell you. Same here she gets around that Jennifer Layton . So how does the scam work ? Do they just charge a premium charge to your mobile phone if you are stupid enough to enter your phone number ? I don't know for sure. However, after you put your phone number into the box they send a text message to it and make you enter it back in. This lets them know that the phone number is a working number. I've heard that the bad guys will call the number and tell you that your prize is ready to ship but you have to pay "shipping and handling" so please tell us your credit card info… I've also heard they will simply call you and try to sell you something else, like magazines. Amazing! they all moved to Australia! Jason Meeks, Jesse Wong, Jennifer Layton …. but different pictures … did they all get amazing makeovers or is it just a stunning coincidence?